I've had mixed experiences with Morgan Matson's books in the past, so I was a little hesitant about this one but I was so excited by the storyline, I figured I'd take a chance - and I am so glad that I did, I loved this book! 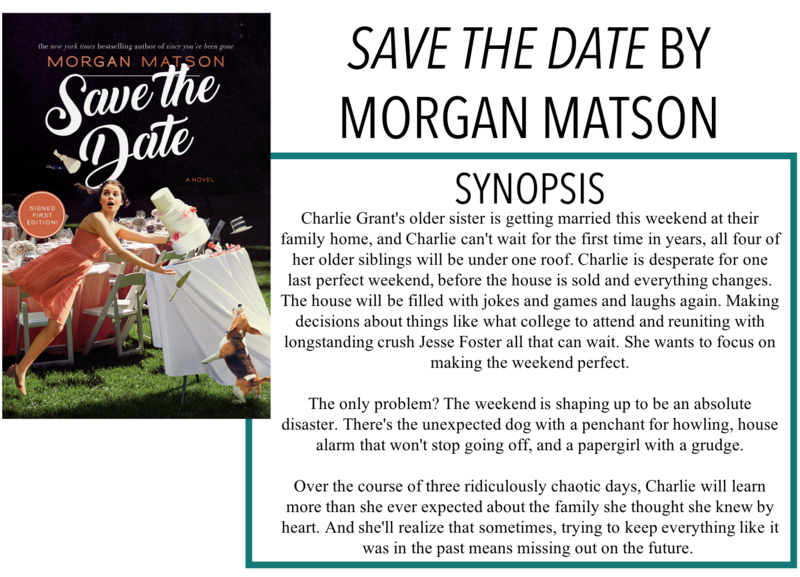 I am back with another review, Save the Date by Morgan Matson. This story follows Charlie, a member of the Grant family of the Grant Central Station comic strip. Charlie's mom, Eleanor, has spent the last 25 years chronicling a fictionalized version of the family's life. Now, with Charlie's sister's wedding, she's decided to end the strip. Charlie can't wait to have all her siblings back home again for the wedding, even if things start to go a bit awry. Set over three crazy days, Charlie works to save her sister's wedding while figuring out her own future outside of her mother's illustrations. First off, the premise of this book sounded really adorable. I'm finding that I'm not loving YA books these days because they often deal with high school and that's not something I really want to relive so if nothing else, I appreciated that this book had almost no mention of high school, despite the main character being 17-years-old. I really enjoyed this aspect and I knew, if nothing else, things were going to be good because there was no high school drama. Matson also has a really great knack for writing intricate stories that are exciting, heart-warming, and heart-breaking all in one go. One minute I was swooning along with Charlie, the next joining her on the latest wedding disaster errand. Sometimes books like these can feel like there is too much going on - because, well, there is a lot going on - but Matson managed to pace everything just right. There may have been a few moments where it was one thing after another but I was so invested in the story, they didn't seem as unbelievable as they could have. I loved the family dynamic with the Grants, and even as Charlie became a bit more aware of the goings on in her family, they still felt real and unique. There are a lot of characters in this book but each one of them felt distinguishable from the others. Each character has a different personality. My only complaint would be that I guessed the big 'family issue' from the very beginning but I think that Matson wrote it in such a way that it's not really meant to be noticeable unless you think about things a certain way. I guess what I'm saying is even though I guessed it, it's not obvious. Overall, I really loved this book and would highly recommend it!